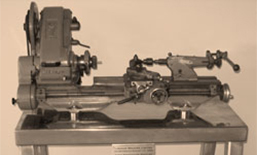 "From a single lathe in my father's basement to a multi-billion dollar global manufacturing company, Linamar has come a long way in our short history. 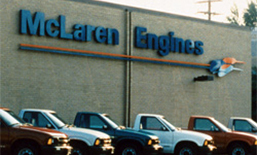 Today the company operates 58 manufacturing facilities around the world. 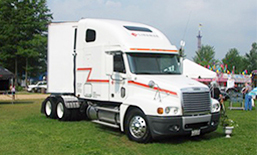 Our precision products provide the light vehicle, commercial truck, off-highway, energy and industrial OEM markets with powertrain system solutions. 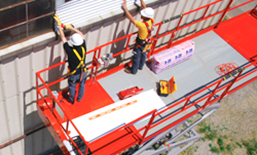 Our Skyjack brand is a global leader of aerial work platforms to the construction and access markets. We are a diversified manufacturing company powering motion, powering work, powering lives. Linamar is turning 50 this year which is a huge milestone for us. 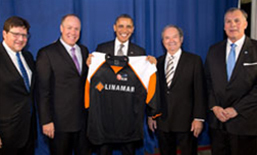 I'm extremely proud of the organization we have built over those years and I'm very confident in what the future holds for Linamar's customers, employees and its financial stakeholders." What is the Linamar Stepping Stool? 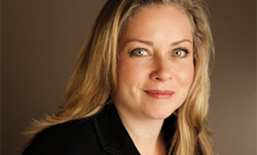 At the core of Linamar's operations is the Stepping Stool. It is an analogy that signifies a stool with three legs. Those legs represent the Customer, the Employee and the Financial stakeholders who each have a vested interest in the long term success of the company. If not in balance at all times, a 3-legged stool is unstable and will eventually fall over. Linamar Stepping Stool is focused on balance. 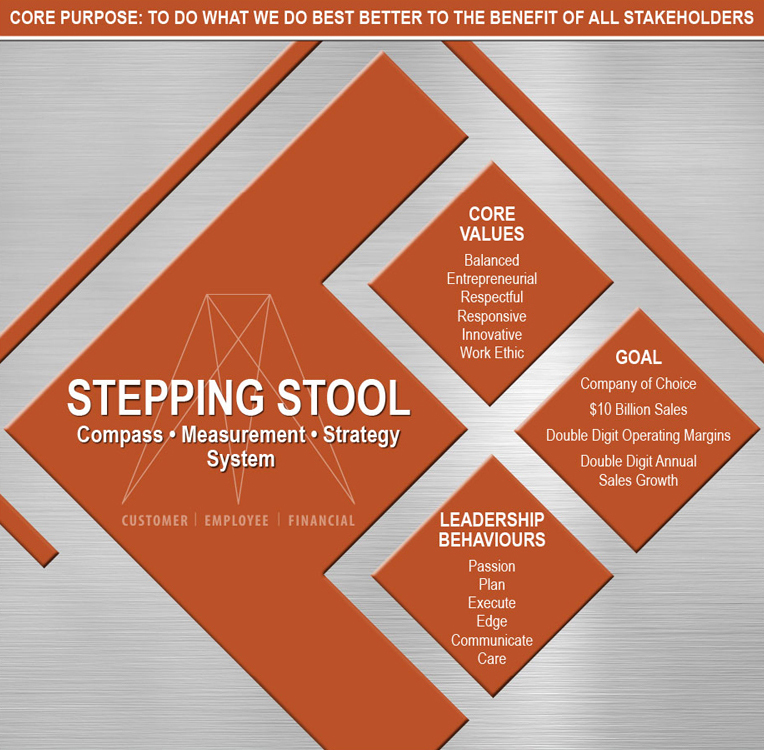 The Stepping Stool analogy helps to focus our decision-making and management practices on providing the most benefit to all of our key stakeholders. 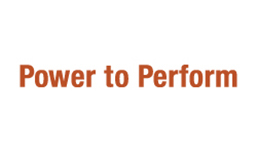 A set of common Key Performance Indicators (KPIs) from each of the 3 stool legs drives operational performance across the entire global organization. Over 60 manufacturing locations worldwide. 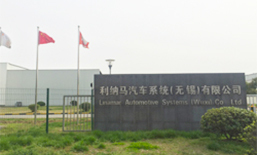 Linamar Corporation is organized along product/process and geographic lines in order to maximize customer satisfaction, efficiency and operational results. The company is structured into individual operating groups each led by a Group President. Global support facilities and functional resources span across the organization to assist with technical expertise, standard operating policies and shared best practices. 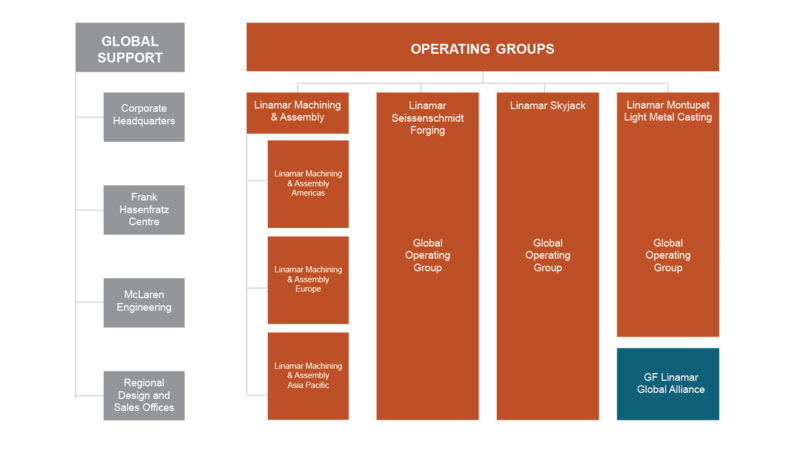 There are currently four Operating Groups within Linamar. 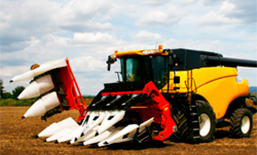 The Linamar Machining and Assembly Group focuses primarily on precision machining and assembly of light, commercial, off-highway, and industrial vehicle engine, transmission, and driveline components as well as solutions for the agricultural and energy markets. The Linamar Skyjack Group is focused on the production of mobile products for consumers; Skyjack is a globally recognized brand providing construction and access markets with reliable lift solutions. 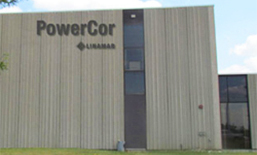 The Linamar Seissenschmidt Forging Group specializes in high volume and high speed hot forging processes, creating gear products to supplement their continuously growing core powertrain business. And the newest operating group is the Linamar Light Metals Casting Group. 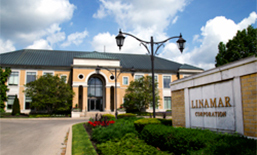 To learn more about this latest Linamar operating group, please see the Press Release. 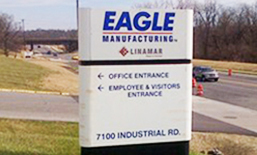 - Linamar expands its capabilities in steel forgings by acquring Carolina Forge Company and renames the plant Linamar Forgings Carolina (LFC). 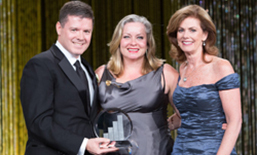 - Chief Executive Officer, Linda Hasenfratz, receives the Ernst & Young Entrepreneur of the Year Award for all of Canada. 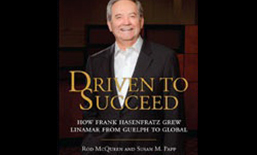 - Linamar founder Mr. Frank Hasenfratz is inducted into the Order of Canada. - Georg Fischer and Linamar team up with a 50/50 joint venture, building an aluminum casting facility, GF Linamar, in the South-Eastern US. 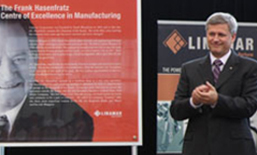 - Linamar acquires Seissenschmidt, a forging company in Germany. We are proud to be able to look back on Seissenschmidt’s long company history prior to becoming a member of the Linamar family. 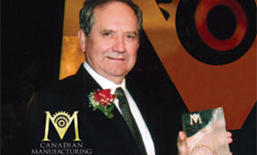 Since the founding of the company in 1846, over 160 years of company history have been written. 1846 Founding of the company by Hermann Bernhard Seissenschmidt. 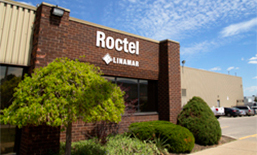 Production of railroad components, railroad car fittings, screws, bolts and nuts. 1858 Steam engines replace water power. 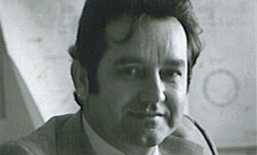 Wilhelm Seissenschmidt takes over the leadership of the company. and addition of 14 drop hammers in the forge. 1893 Establishment of a company health fund, construction of company housing, donation of charitable housing and a hospital to the city of Plettenberg. 1901 After the death of Wilhelm Seissenschmidt his widow, Eleonore, takes over the company leadership, followed in 1917 by their daughter, Anna Engelhard, wife of Medical Counsellor, Dr. Adolf Engelhard. takes over the leadership of the company. Founding of the “Medical Counsellor Dr. Adolf Engelhard Foundation” (Sanitätsrat Dr. Adolf Engelhard-Stiftung) for supporting sick and needy employees or surviving dependents. 1933/1934 Expansion of the company by building a modern forging production site. 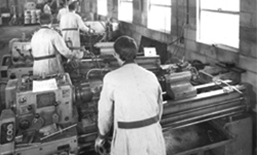 1948 Re-start of production: fasteners for heating radiators. 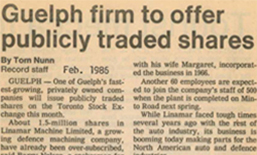 1964 - 1976 Investment in the first multi-stage press and commencement of production for forged parts supplied to the automotive industry. company under the leadership of Hans-Dieter Gödeke. 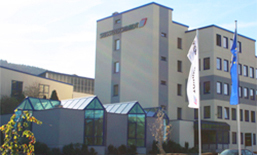 1999 Rüdiger Groos and Hermann-Josef Müller join the Management Board of the company. 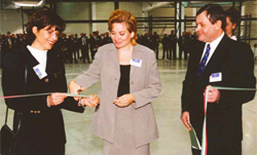 2001 Change of name to SEISSENSCHMIDT AG and construction of a new logistics center. Founding of SEISSENSCHMIDT Corporation in the US. 2002 Construction of a new production hall and a training and conference center. 2004 With the investment in a multi-stage press of the type AMP 70 XL HFE, SEISSENSCHMIDT is now equipped with a range of fully-automatic multi-stage presses that is unique worldwide. At the same time, extensive investments in machining mean that the number of parts supplied as ready-for-assembly components is continuing to increase. 2006 Founding of SEISSENSCHMIDT Components Processing GmbH + Co. KG, which is specialized in machining processes. SEISSENSCHMIDT once again expands its unique range of fully automatic multi-stage presses by investing in an HM 75 XL HFE. 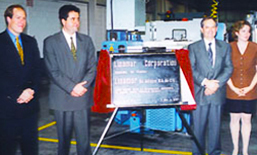 2007 Founding of the subsidiary SEISSENSCHMIDT Precision Components Kft. in Hungary. Transfer of conventional hot forging to the new production site. Building of a production site for the SEISSENSCHMIDT Corporation in Oscoda in the state of Michigan, USA. 2008 SEISSENSCHMIDT Components Processing GmbH + Co. KG undergoes expansion with the construction of a new machining site. Acquisition of the heat-treatment company Reitz GmbH & Co. KG in Halver, North Rhine-Westphalia, Germany. 2009 Renaming of Reitz GmbH & Co. KG to become SEISSENSCHMIDT Heat Treatment GmbH + Co. KG. Dr. Ekkehard Körner is appointed to the board at SEISSENSCHMIDT AG. HM 35 is added to the existing machinery. Processing GmbH + Co. KG undergoes expansion. Kft. in Hungary provides a new spectrum of parts. 2011 Purchase of a new office building to expand the area of administration.